I am a paper mache artist. 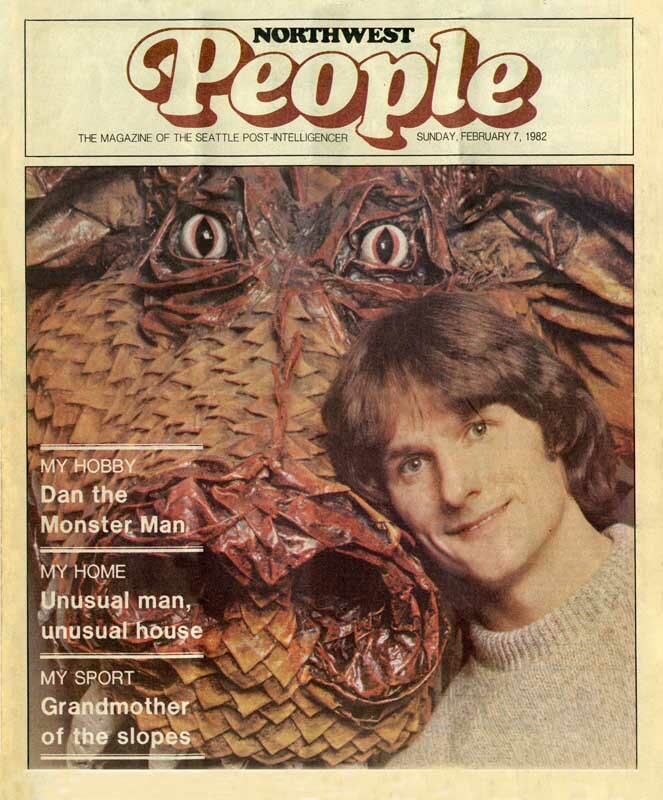 Around the Pacific Northwest I am known as Dan “the Monster Man.” That is because of a newpaper article written about me in 1982. Without my knowledge, my mother sent a letter to the Seattle Post Intelligencer’s “People” section of the our Seattle newspaper. A reporter and photographer showed up at my dingy little apartment close to the zoo (appropriately). I lived on a busy street and was known to the locals as “the crazy guy with all the monsters.” They asked questions and took pictures and two weeks later the article appeared (with my baby face) on the front cover and the headline “Dan the Monster Man.” I suppose this kind of thing happens to all of the Dans in the world simply because “Dan” rhymes with “man.” Anyway, I’ve been making paper mache sculpture for many years. Actually, I was thinking of adding a second “many” to that sentence because of how long it truly has been since I started this. I made my first dragon when I was twenty-two years old. I’m now sixty-seven! 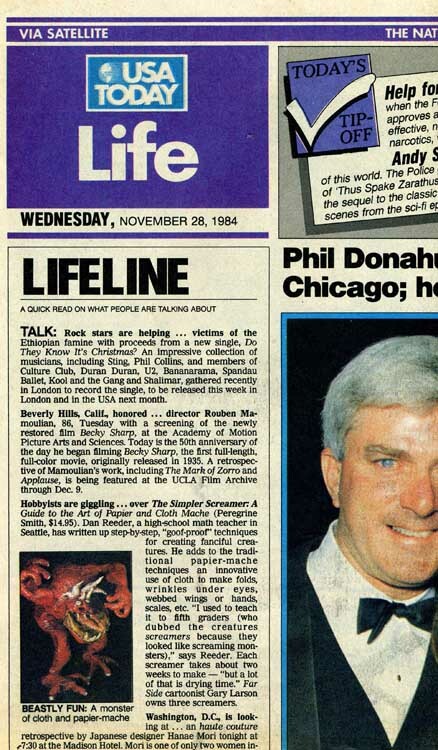 (I’ll bet you thought I was only sixty-six by the picture at the top of the page.) I made my first monster along with my fifth grade students. I wanted my kids to do an art project that I knew would be successful. And I wanted it to be messy and take some effort. Paper mache monsters fit the bill perfectly. I developed my unique variation of paper mache combined with cloth and glue in an attempt to make our projects stronger. There was lots of Elmer’s glue at the school and I had kids bring in old bed sheets. That cloth skin certainly did add strength. The cloth also opened possibilities for detail not afforded by traditional paper mache. The bottom line is that most paper mache artists sculpt with some armature material like chicken wire and then put a “skin” of mache over it. I actually sculpt with paper mache balls and then add a skin “cloth mache”. Yes, I know the term doesn’t make sense. Still for a lack of a better term, I coined the phrase “cloth mache” when I wrote about the process in my first book, The Simple Screamer: A Guide to the Art of Paper and Cloth Mâché (1984, Gibbs-Smith Publishers). That book detailed the making of a “Screamer”, a monster just like we used to make in my elementary classroom. (The kids found that it was easier to paint the mouths of their monsters when they were open. So many of the monsters looked like they were screaming and the monsters became “Screamers.”) That book, and the sequel, Make Something Ugly for a Change: The Definitive Guide to Paper and Cloth Mâché (1999) were in print for over 25 years and sold around the world. I humbly credit those books with started a small renaissance in the use of this under-rated, under-utilized art form. I should mention that my Screamer book got a nice boost when it showed up in the USA Today newspaper. My Papier Mâché Monsters: Turning Trinkets and Trash into Magnificent Monstrosities book is the sequel to the sequel of the Screamer book. You can read more about this book on the “My Paper Mache Books” page. Before you leave, perhaps you’d like to have a peek into my studio. Well, it’s my old studio. I’ve since remodeled. This photo is a few years old. Still, it’s fun to do this. Click on the photo below and it will take you to the work of renowned Virtual Reality photographer Bradford Bohonus. You will be able to take a 270 degree look around. It’s amazing. The bottom line is that, after all of these years, I still love this art form. It “feeds” me the right way. It is a wonderful vehicle for artistic self-expression. If you haven’t tried it, you should. Period. By the way, you can email me here.